We started-up in West Berkeley as Adams & Chittenden Scientific Glass in the fall of 1993. In the winter of 1997 we moved to our new, expanded facility. Our location in the San Francisco Bay Area has brought us into contact with a wide variety of glass users and we’ve benefited from the diversity of work being done here. We have been accumulating glassblowers and equipment, and are constantly learning about new applications for glass and better ways to serve our customers. Tom Adams (on the left) graduated from the University of California at Berkeley with a degree in Physics. 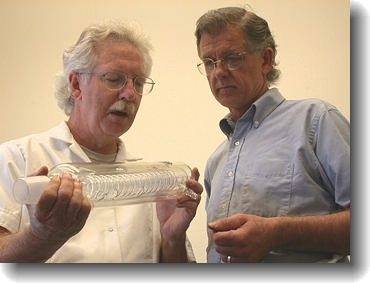 Tom began scientific glassblowing in 1971 at R & D Glass in Berkeley, eventually becoming production manager. He has long experience in design and fabrication of all varieties of scientific and laboratory glassware. He lives with his two kids, a dog, and sea kayaks in Richmond. He enjoys folk dancing and paddles his kayak on the San Francisco Bay and environs (check out Bay Area Sea Kayakers). George Chittenden (on the right) graduated from San Jose State University with a degree in Art, specializing in ceramics and glass. He apprenticed in scientific glassblowing for four years with Willy Van Bragt at Selectro Scientific Glass in Sunnyvale. In 1984 he moved to R & D Glass, where he worked until mid-1993 as a primary glassblower in all facets of custom and production glass fabrication. He combines his love of glass with a lifelong pursuit of music. He is also responsible for most of the photography on this site. Lise Liepman shameless plug for my wife! We are proud to appear in “Made in Berkeley”, a short film about industry and vision. Action footage includes bread makers, welders, and harpsichord building, in addition to ~6 seconds of (exciting!) scientific glassblowing; and that is just from our block!! Bravo to the filmmakers for a well made film, and making the important argument for diversity in an urban environment. We are supporting members and participants in WEBAIC, the West Berkeley Artisans and Industrial Companies, who continue the effort to maintain a sustainable urban environment in West Berkeley – a place for all of us to thrive. And for a historical perspective, an article from the 1918 New York Times is fun to note. We are also proud to be re-certified as participants in the Bay Area Green Business Program.